Literacy, and in turn health literacy, has been strongly linked to a person’s health outcomes. The literacy levels of a person is predictive of their health outcomes. Appropriate interventions that address the social determinants of health can influence a person’s overall health positively. 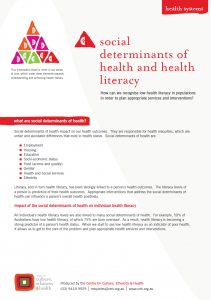 An individual’s health literacy levels are also linked to many social determinants of health. For example, 59% of Australians have low health literacy, of which 75% are born overseas(1). As a result, health literacy is becoming a strong predictor of a person’s health status. When we start to see low health literacy as an indicator of poor health, it allows us to get to the core of the problem and plan appropriate health services and interventions. Good empirical data can help to build interventions around health issues. Chronic disease interventions with Indigenous communities need to recognise culture based literacy. In the Northern Territory, a health promotion team has developed a felt story board that explores the impacts associated with smoking during pregnancy to use in their health education program with Indigenous communities(2). 1. Australian Bureau of Statistics, Adult Literacy and Life Skills Survey, 2006. 2. Turner, P. Smoking Cessation Story Board. Department of Health and Families NT, 2009.